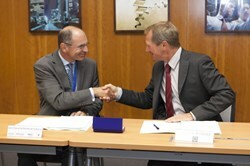 A major contract for the ITER Project and for Europe: the CEO of Cofely Axima, Jean Pascal de Peretti de la Rocca, and the Director of Fusion for Energy, Henrik Bindslev, sign the Tokamak Complex building services contract in Barcelona. The European Domestic Agency for ITER, Fusion for Energy, has concluded a EUR 530 million contract for Tokamak Complex building services with a Franco-German consortium comprising Cofely Axima, Cofely Ineo and Cofely Endel (part of the GDF Suez Group) and the M +W Group GmbH. 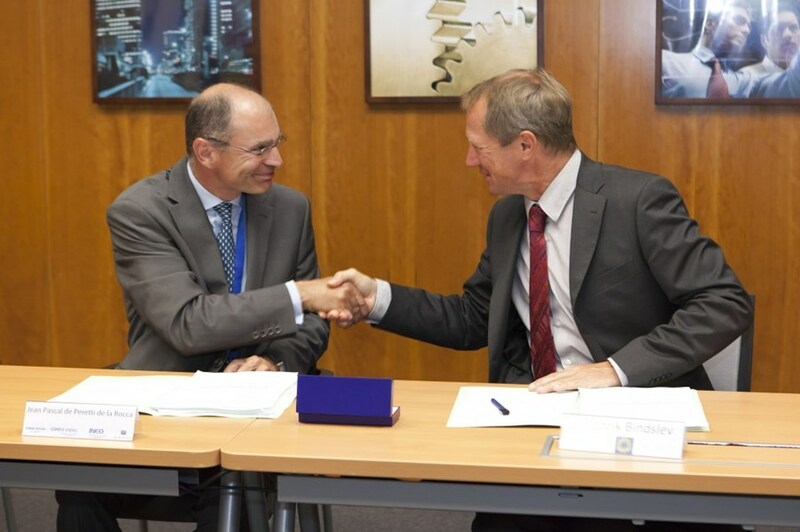 This is the largest contract ever awarded for the ITER Project by Europe, which is responsible for the construction of 39 scientific buildings and dedicated areas on the ITER platform. The building services contract covers the design, supply, installation and commissioning of the mechanical and electrical equipment for the Tokamak Complex plus the surrounding buildings—a total volume of 97,200 m3. Scope will include an HVAC system (Heating Ventilation Air Conditioning) powerful enough to treat 1,000,000 m³ of airflow/hour, Instrumentation & Control (I&C) systems, power supplies, interior and exterior lighting, gas and liquid networks, state-of-the-art fire detection and extinguishing systems (2,000 fire detectors), pipe fittings, and handling equipment with various interfaces to buildings and systems. The contract signature follows on the heels of the main Tokamak Complex construction contract signed last December and which was kicked off this year. Under this latest contract, the works necessary for the installation of ITER's high-tech Assembly Phase equipment will get underway. Read the full story on the Fusion for Energy website.